I have been a “Grammy” for several years now and all of my grandchildren are a long distance from me. I visit them as often as I can and I miss them terribly when I am away. Through the years I have found some ways to connect with those long distance grandchildren. I must also give credit to my children who are very good to share videos and photos of their babies via social networks. Here are 6 ways that I would like to share with you that you can connect with long distance grandchildren. 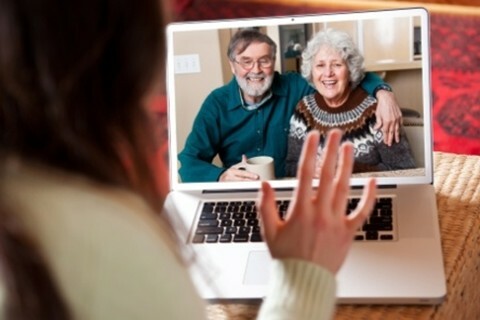 Most of the time that I spend with my grandchildren is through my computer monitor via the internet and Skype – a video conferencing software (you can use another software such as Google hangout, etc.). I love it when I answer the video call and see those sweet little faces smiling at me. It is not as great as being able to hug them or sit on their bedroom floor and sing Bible songs with them before nap, but I sure am thankful for this amazing technology. Because of it my grandchildren know me when I am able to go for an “in person” visit. It is great to catch up on what is happening in their day-to-day life. Since my grandchildren are still very young, I just never know what they are going to say to me. For example, just the other day my 2 year old granddaughter asked me if I was potty trained. Although I am potty trained I almost needed a diaper for how hard I laughed when she caught me off guard. Now that is a precious memory — albeit virtual. I love it when I answer the video call and see those sweet little faces smiling at me. One year for Christmas I recorded some video books for my grandsons. Each of these grandsons belonged to different children of mine so I selected a favorite childhood book of my own children. Then I had my hubby help video record me reading the book. I did the video like I was doing a library story hour. I read the words and showed the pictures. To make it extra special, I sent a copy of the book along with the video that I burned to a DVD so that my grandchildren could read along (even though they were not of reading age yet). I remember my daughter’s tears as she opened the gift during our Christmas Skype session — I had recorded her favorite childhood book. This is something that as my grandchildren get older I would love to do. I want to share with them my love of birds. Here in New Mexico we have a whole different mix of birds than they see in the Midwest USA. But since I used to live up there I recognize many bird voices and can identify birds that I see in their yard. I plan to get them a bird guide for their region as well as some binoculars so that when they see or hear a particular bird they can report back to me. I might even create a little healthy competition that they can play with their siblings. They will remember you when they look for birds and your favorite hobby will become even more special as you teach your grandchildren through a fun game. I am terrible at remembering birthdays! But I have purposed that I will remember my grandchildren’s birthdays and send each one a special little gift on that special day. Again with the popularity of technology it is easy to send an email or text on special occasions, but don’t forget about the “snail mail”. Children love to receive packages in the mail. Be sure that you let them know that this is a gift that you chose only for them because in your eyes they are very, very special. If you cannot keep it in your mind, jot a note in a journal about the current special interests of each of your grandchildren. Use these notes to help you come up with special ways to interact specifically with each grandchild. It will be helpful to refer to your notes for any of the aforementioned activities. One of the greatest joys of my “Grammy” role has been to plan a trip to my daughter’s house to help with the older children when she delivers a new precious baby. I realize this is not always possible and believe you me it is not a vacation … but I cannot think of a better way to spend a week or two during these years when my grandchildren are young. I have enjoyed playing with cars, pretending to drink tea, making favorite meals, reading favorite books and teaching my grandchildren Bible songs. I especially love that they remember the Bible songs and when I see them on Skype we still sing together. Of course they want to teach me songs too … but it is hard to find one that Grammy does not already know because to them it is a new song, but to me it is still in my heart from when I sang it with my own children or listened to it on CD (or cassette tape) many, many years ago. Living far from your grandchildren can be very lonely, but it does not need to alienate you from them. Take my advice and incorporate some of these things into your routine, or think of some other ways to connect with long distance grandchildren. Feel free to share your ideas in the comments below. Related reading: What is the Role of a Christian Grandfather or Grandmother? Next post: What Does The Bible Say About Babylon? What Is Its Significance?